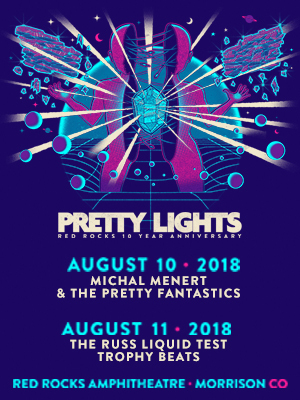 Commemorating 10 years of Pretty Lights at Red Rocks. New Era Fitted 5950 hats adorned with the classic PL logo. 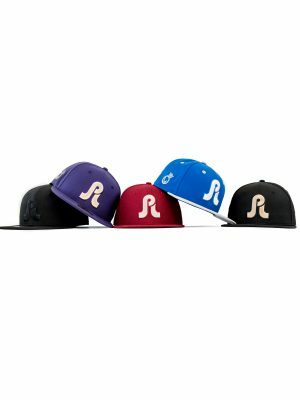 Featuring an embroidered Red Rocks monolith insignia on the back closure, high density raised PL logo embroidery, the “J-Crown” and “New Era” logo accenting the side. *Each customer is able to purchase (1) hat, per color. Available exclusively online and while supplies last. From the mountains of Colorado to travels that have taken them the world over, Pretty Lights and Akomplice are cut from the same cloth. They both exist to innovate. 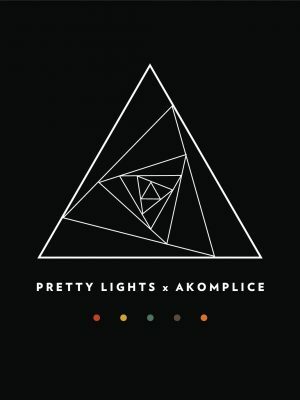 In the same way that Pretty Lights was revolutionary to the electronic movement, Akomplice also helped pave the path for modern-day streetwear. It is under this framework of shared history and mutual respect that they decided to join forces. Together we have created this essentials pack intended to enhance the summer festival experience. A nylon trench windbreaker that fits inside it’s own pocket, turning it into a small bag. Lastly, a notebook for high-vibe, magical ideas. Write them down, reflect on them and remember that this is the first step in breathing them to life. “Rainbows & Waterfalls” – The new single from Pretty Lights is available now! LETTER 22 is a story of the positivity that underscores all movement towards progress and enlightenment, no matter how many obstacles stand in the way. It is the story of a pure force of will, hidden somewhere out there, that is dedicated to revealing evolutionary truths to this universe in a systematic way. LETTER 22 is also the story of all of us, who have each, at one time or another, felt ourselves to be in possession of knowledge or insight that appears an innate, universal truth to us, but is callously dismissed by others. In such moments, it is easy to feel as though you truly are from a different planet, governed by a different sense of logic and order than this one, which used to feel so familiar. 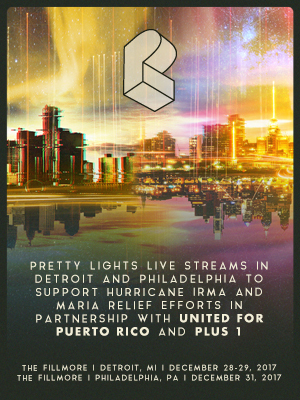 In ongoing efforts to provide relief assistance to citizens in Puerto Rico facing devastation from Hurricane Irma and Maria, Pretty Lights Live will be streaming the PL sets on December 28-29 at The Fillmore in Detroit, MI (10:15pm ET) and on December 31 at The Fillmore in Philadelphia, PA (10:05pm ET) on the Pretty Lights Facebook page and the Pretty Lights YouTube Channel. A “donate” option will be available on each platform to contribute monetary donations to United for Puerto Rico. All donations from the streams will go directly to United for Puerto Rico to assist with hurricane relief efforts. Additionally, $1 from all ticket sales in Detroit and Philadelphia will go to United for Puerto Rico (via our friends at Plus 1). 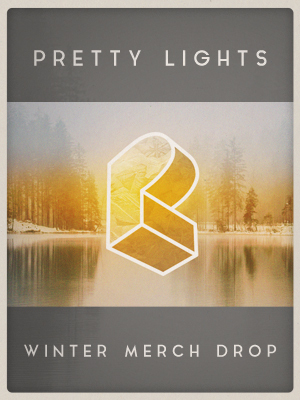 The PL online merch store has been stocked with new gear: Pretty Lights x Grassroots fitted and snap back hats, new apparel featuring designs from Boxhead and Sara Bott, deep discounts on select items and more. Available exclusively online.